The University of Hartford Women’s Soccer College ID Camp is for any high school girls with ambitions of playing soccer at the college level. It is also open to 1st-year and 2nd-year junior college girls. The event is a 6-hour training program for both field players and goalkeepers on the 4th of March from 3:00 PM to 6:00 PM. It will take place at the Al-Marzook Field in the University of Hartford campus. The camp is an exceptional preparatory ground for top-level soccer competition. It will also provide the participants a venue to showcase their skills in front of the university’s coaching staff. The training will cover the technical, tactical, physical, and psychological facets of the game. In addition, this college ID camp will provide an insight of what it takes to play at the elite level. The University of Hartford is a private, coeducational, independent, nonsectarian university in West Hartford, Connecticut. It is a member of the National Association of Independent Colleges and Universities. The university offers programs with accreditations from the Engineering Accreditation Commission of the Accreditation Board for Engineering and Technology, the Association to Advance Collegiate Schools of Business, and the New England Association of Schools and Colleges-Commission on Institutions of Higher Education. Furthermore, the University of Hartford is 176th in the National Universities rankings. It is also 57th in Engineering Programs rankings and 216th in Business Programs rankings. In sports, the university has 18 athletic teams competing in the America East Conference of NCAA Division I. They are the Hawks and scarlet and white are their identity colors. Head Coach John Natale is leading the University of Hartford women’s soccer program since 2004. Under his guidance, the Hawks women’s soccer has already 4 America East Regular Season Championships and an America East Tournament Championship. Moreover, Coach John Natale is a 5-time America East Coach of the Year awardee. Then, the Hawks women’s soccer associate head coach is Ciara Crinion. And Finally, Allison Saucier is the team’s assistant coach. 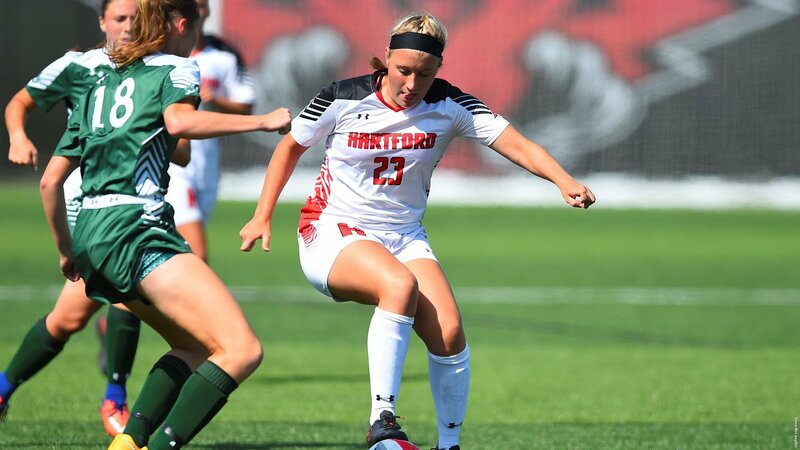 The University of Hartford Women's Soccer College ID Camp is for any high school girls with ambitions of playing soccer at the college level.